Located in Caye Caulker, Caye Reef Condos features a garden and year-round outdoor pool. San Pedro is 12 mi away. Free WiFi is provided throughout the property. All units are air conditioned and feature a cable flat-screen TV. Some units include a dining area and/or balcony. There is also a kitchen, equipped with an oven and microwave. A toaster is also available, as well as a coffee machine and a kettle. There is a private bathroom with free toiletries in every unit. Towels and bed linen are featured. 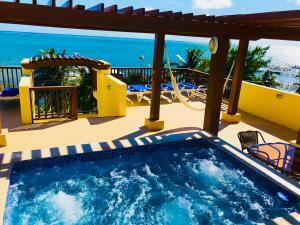 Caye Reef Condos also includes a hot tub and terrace. The property welcomes families and children. Belize City is 21 mi from Caye Reef Condos. The nearest airport is Philip S. W. Goldson International Airport, 24 mi from the property.